The real win for us is that if we get more members, we get a bigger intelligent community of people who are doing deals so we can do deals with them. And he wins because he provides financing and makes a little dough on that. So, it’s more of a discussion between Jill and I, and listeners without Justin himself, which we’ll talk about, Justin will join us on Friday to celebrate that. Steven Butala: Before we get into it, though, let’s take a question posted by one of our members on the LandInvestors.com online community. It’s free. Jill DeWit: Steven asks, “Have any of you used an escrow for a reduced fee to just review the documents and generate a preliminary title report for the buyer on a terms deal where the title will not change until the land contract terms are met and the parties are okay transferring funds directly? So, no escrow service needed for that function.” That is brilliant. Steven Butala: I love the concept. But I’m not so sure an escrow person is who you want. What you want is maybe a paralegal who’s done a bunch of deals. There’s a lot of paralegals who become paralegals before they’re attorneys and they have no experience at all. So, excuse me, what you want is probably to hire a law firm and you’re gonna get sticker shock over this, but it’s a great question and I love the concept because you want to get everything done right, but the unfortunate answer is yes you can do it, it’s going to be expensive, and the first time you do it, by the way, you need to look over their shoulder every step of the way and learn, because it’s gonna be eventually you who’s gonna do it. Or you could use that escrow, ’cause escrow companies do terms deals all the time. They’re just not land contract deals. They’re deed of trust deals like a mortgage, and I don’t want to get too complicated here, but that’s not really how you want to do a terms deal. However, I can’t express this enough, having a second set of eyes to look over this stuff is brilliant. Steven Butala: Today’s topic, outsourcing funding with Plum Investment. This is the meat of the show. Jill DeWit: I see this as filling a huge need that … kind of the missing piece. Steven Butala: [crosstalk] and InfoReports.com do that perfectly well. Jill DeWit: As well as Title Pro 24/7 and other things in our toolbox, if you will. And then the last thing was darn funding. Steven Butala: So great, you’ve got a deal, you’ve done your due diligence. You’re sitting there looking at this great deal. You’re about to pay $10,000 for it, you know it’s worth $35,000. I don’t have $10,000. Jill DeWit: Yeah, shucks. What do I do? And here comes Justin, and here comes … and where do you find this, by the way? If you go to LandInvestors.com, our online community, at the very top there’s a menu item that says, “Deal funding”. And that’s what you do, and just fill that out. It’s awesome. And you do not have to be a member, by the way. Although we want you to be a member. Do you need to be a member? Steven Butala: You do not have to be a member. Jill DeWit: Don’t mean to open up a whole can of worms here. Steven Butala: Now that I’m thinking about it. Jill DeWit: I don’t think you technically have to because a good deal, everybody’s gonna get … We will fund a good deal, someone will fund a good deal. Slash however, I will say this. 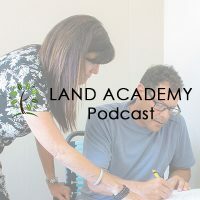 We all know what we all know and we know that people who are members of Land Academy, we know what the due diligence went into, we know how they pick the county, we know all the things that they checked ahead of time, so the deals are usually better deals going through the process, so they definitely get pushed to the top. Steven Butala: “I’ve done it with Jack Bosch. I’ve done it with Land Geek. I get it.” Half the people that are with us in our membership group have said the same thing. Jill DeWit: Yeah, and that they all came from other things and I think it’s great. We could fill in the pieces. There are some holes and we’ll help you with that. Steven Butala: That’s a nice way to say that. Steven Butala: I was gonna say a bunch of other stuff, but I won’t. Jill DeWit: Good. But the point of the show today, though, is about this member taking it upon himself to create this funding source basically and helping everybody make more money really by completing deals that they were having trouble getting funding. Jill DeWit: Well, that’s how we have been. Jill DeWit: You don’t have to. Steven Butala: You can start with, let’s say you have a $100,000 deal that you’re bringing, ’cause you’re great at Zeta. And it’s worth $300,000. This just happened. Steven Butala: That’s the kind of deal that now you got, and then you’re gonna split that? You’re gonna split that with Justin, the proceeds of that. That’s gonna launch your career. You don’t have to have any money to start. Steven Butala: it’s not like these guru stupid shows. And we have always said pay cash, buy your own thing, but I think for me as a new person, what always happens, you’re going along, maybe you’re buying $1000 properties and flipping them for $3000. And then you can move to $5000. Invariably, there’s gonna be someone that calls back and goes, and you say, “What else do you have?” And they go, “Well, actually, my dad and I own 160 acres over here. You wouldn’t be interested in that, would you?” And this is where you can now go, “Wow, I would.” And for most people, then they panic. And they feel like, “I don’t have that kind of money.” Now you do. That’s how I see it. It’s ’cause I don’t want to change what we’ve said in the past. Steven Butala: Well, this is a new tool. Steven Butala: So, I think that the difference, it doesn’t matter. I mean, you’re listening to the show, so you know the difference. Steven Butala: You really truly don’t have to have any money. Let me rephrase that. Jill DeWit: You gotta send out the mail. Steven Butala: How you send out the mailers and how you price the mailers, and the properties that you’re fishing for, don’t have to be $1000 properties. Jill DeWit: That’s the point. Thank you. Steven Butala: They don’t have to be tied to your money that you’ve allocated to do this. Steven Butala: You can shoot for the moon now and if it’s a smoking, smoking deal that fits within Plum’s investment criteria, and frankly us, too. We do some deals, too. Jill DeWit: Now you’re okay. Steven Butala: You can get a lot farther a lot faster, as ironic as it sounds. Steven Butala: A lot farther a lot faster financially without using your own money, using Plum. Jill DeWit: And it’s not like you’re having to call your dad or call your rich uncle or something like that. Steven Butala: Or use your money. Steven Butala: Even if you do have 15 or 20 or $30,000, use it on some deals, but this is what we do. We use some money for our deals. Some of our money for deals and some … on bigger deals, we use other people’s money. In a very responsible way. So, it’s a good thing. This is a total game changer and we don’t celebrate stuff enough. You know why we don’t and I don’t? Jill DeWit: Yeah, I don’t want to say that. Steven Butala: That’s the worst thing. Nothing more turn off. Jill DeWit: “Anybody can do this,” I don’t want to say that, too. Jill DeWit: It’s a lot of work. “It’s easy. We’ll show you the way.” I don’t want to say that. ‘Cause I’m not gonna hold your hand the whole time. You gotta learn this yourself. There’s a lot you gotta bring to the table. Anyway, I’m happy to celebrate this, too, ’cause this is something great that one of our people has done. Oh, go ahead. Sorry. Steven Butala: I was gonna end it. Jill DeWit: Okay. Good. I’ll save what I have to say for the after show. Steven Butala: Well, you’ve done it again. 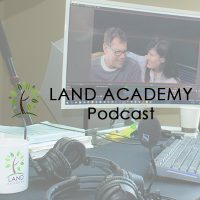 You’ve spent another 10 minutes or so listening to the Land Academy Show. Join us next time where we discuss outsourcing your transaction with TitleNine.com. Jill DeWit: Cool. And we answer your questions posted on our online community, LandInvestors.com. It’s free. Steven Butala: You are not alone in your real estate ambition. What were you gonna say, Jill? Jill DeWit: Happy birthday to you. Jill DeWit: Happy birthday to you. Happy birthday dear Steven, happy birthday to you. I was gonna do it at the beginning, I thought, “No, wait.” Then I couldn’t say the middle, “No, wait.” So, now here at the end, it’s Tuesday, today’s your birthday. I have something really fun planned for you tonight. Jill DeWit: I’m not gonna tell you. I certainly can’t say it here. Steven Butala: Jill, you’re the best. Steven Butala: What were you doing recently and I’m just like, “You are so the right girl for me”? Oh, we went to Costco. We spent … this happens a lot. Jill DeWit: That was funny. Jill DeWit: That’s all that was, alcohol and electronics. Steven Butala: There’s no food, there’s no clothes. Jill DeWit: No toilet paper. Steven Butala: It’s moments like that, you just know you’re with the right person when they say stuff like that. Like that GPS coordinate thing yesterday. Jill DeWit: Oh, thank you. I appreciate that. And I appreciate you and happy birthday. Jill DeWit: Hey, wherever you are listening or watching, please be sure and rate us there. We are Steve and Jill. Steven Butala: To buy undervalued property. I mean it, Jill.